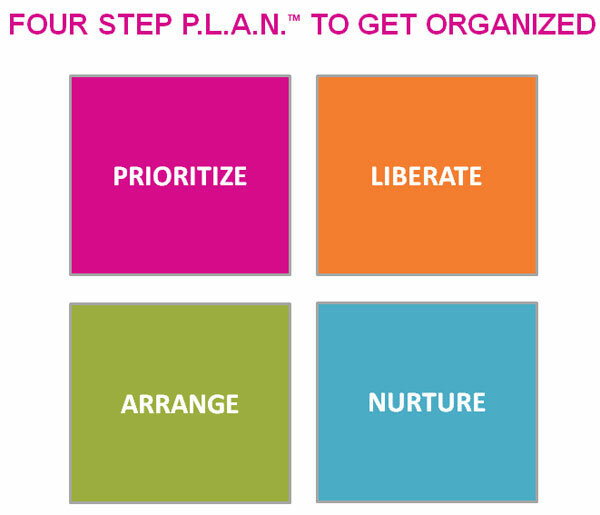 My Simple Four-Step P.L.A.N.™ to Get Organized! Thinking about getting organized can often be overwhelming. Like any big project, it feels much easier to accomplish and far less daunting if you can break it down into manageable pieces. Organizing should be looked at from beginning to end. Impulsively we might want to ‘fix’ a space by shopping for an inspiring new piece. Often when bringing back something that looked great in store, whether it be a piece of furniture or a storage piece, we find it simply doesn’t function as it should at home. Here is my simple four-step P.L.A.N.™ to get organized which looks at the process from beginning to end to help make sure the energy you invest will pay off. Consider enlisting help if you find yourself stuck in one area and unable to move forward. Identify the purpose of the space – both what you want to do and how you want to feel. Aim for five or fewer activities. Find words to describe the atmosphere of the room – serene, energetic, calm, homey, minimal, lived-in. Articulating your vision is important for it is your guide through the other parts of the organizing process. If you don’t start here, you are not clear about what you’re aiming for. The challenges here include deciding between competing priorities and, if you live with others, competing styles. Often, it is an over-looked discussion but it is also helpful to make sure everyone is on board in creating and sustaining an environment in which you can all thrive. Once you have your vision, you will want to let go of items that don’t support it. When you let go of possessions you liberate both your space and your mind. Challenges include moving to the Arrange stage too early in the process. If you’ve ever had bins and baskets that don’t work, this may be why. Also, it is important to remain self-aware when shopping. The lure of fashionable form may be regretted if function has been overlooked. Creating order is one thing. Maintaining it is another. We all have different tolerance levels for chaos, so it is important to develop habits that suit you. This may mean cleaning your desk at the end of every day, or clear the clothes off the chair in your room every three days. The challenges here is the belief that once set up, a system should work forever with no effort. This is not true. Systems should be designed to work with you, so if you have been thorough and honest in assessing your preferences, you’re more likely to achieve quick success. It’s also easy to forget to devote time to restoring order. PRODUCTIVITY TRUTH: Vision is your guide through the organizing process. Start here to achieve your goal. In a 2011 study commissioned by Professional Organizers in Canada, 7 in 10 Canadians who work say their workplace is disorganized and report feelings of stress, frustration and failure. Disorganization not only affects the individual’s work, it affects others – both colleagues and customers. Added up, there is a significant cost to being disorganized. Time lost searching for misplaced items for information. Being late for or missing appointments. Missing work deliverables or submitting incomplete or unprofessional work. Not spending time on the most important tasks. Missing work due to stress or preventable workplace injuries. Lower overall productivity and/or working longer hours. Job dissatisfaction and other negative feelings. Getting organized is not about moving from procrastination to perfection. It is about being the most productive person you can be. A sense of achievement is indeed what drives many of us. There is research to suggest happy people are more productive people. I suggest the reverse is also true – productive people are more satisfied people. Now, what will you spend all that extra time on? TRUTHBOMB: Getting organized is not about moving from procrastination to perfection. It is about being the most productive person you can be. Enjoy this code, CHAIRLOVE, to receive a special price for your Core Chair. 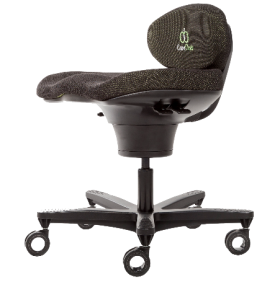 Visit the CoreChair website to order.